Home programming tips Different between compiler and IDE . 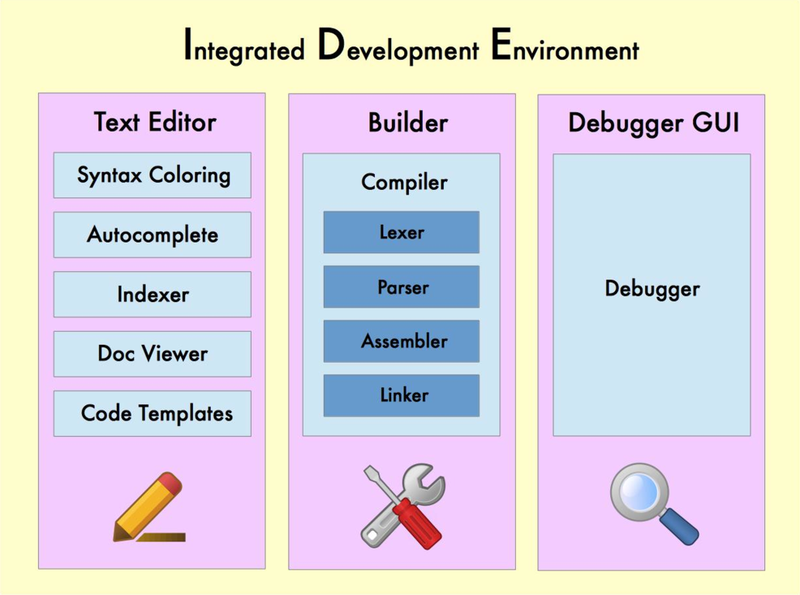 IDE means Integrated Development Environment. Without compiler, ide is value less. ide is q package of some tools like graphical interface, text editor, debugger sometimes containing compiler. It also contain code coverage tools, version management tools, automated help and documentation tools, graphical resource editors, refactoring wizards, and many, many other useful tools which help us code quickly. Eclipse, NetBeans IDE, Codeblocks, Visual Studio, Bloodshed Dev etc. A compiler is a part of ide. ide dependent on compiler. ide only help us to code easily. Compiler convert our codes to machine language. Different between compiler and IDE .What is compiler ? Compiler is not IDE Compiler is a platform or a place in which we compile our code. Which means, we write the source code using any programming language and compiler translate it into object code or binary code or computer language. Every high level language use a compiler to compile source code into computer code which is unique. We all know computer can't understand our language. So we must make our language understandable to machine and compiler do this job.